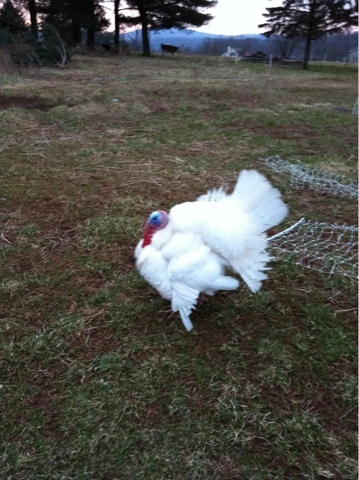 The turkey Tom has been moving around the farm alone. Every day we see him by himself..usually the turkey hen is with him. The last few days he has been moving about solo. We search for her, in hopes that she is still here, that nothing did her in, carried her away, or that there is not a death by natural causes. Then she reappears. 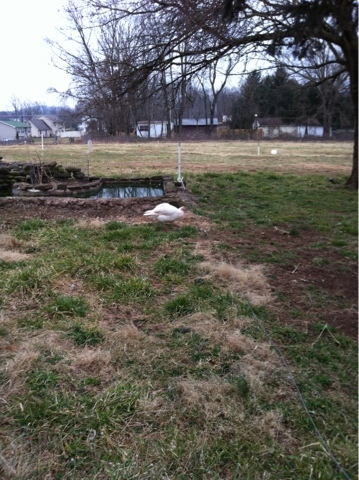 Clover, the protective goose is getting more aggressive. Days are warming and getting longer. The turkey hen is probably making a nest. The geese certainly are, there are piles of dry grass and straw forming in a couple of spots..they will decide on a final location in the next few week. Even the ducks are scouting out a spot. Yesterday we had one egg from hundreds of chickens. But it is happening..the stirrings, the nestings, the questions of where the females are hiding. Spring is coming. The birds all make eggs in early spring and do so for a while. They all stop in the cold, dark days of winter. We don't have a rooster, so the chicken eggs are not fertilized, but the turkeys, geese and ducks all have the potential to provide us with polts, goslings and ducklings. Sybil, the milk cow, sure is carrying herself like there is a baby on board. After the dark days of winter the possibility of the farm filling up is exciting! Before we moved onto this property there was a business here selling pet birds, from finches to macaws and all the gear that goes along with that. I've never kept a pet bird. There have been people I've known who own a canary or parakeet but a dog was enough for me before farming fulltime. There were a lot of buildings on the property before we bought it. Buildings that housed birds and had electric running to them, as most birds need to stay warm. Lots of gear thrown into our stand of trees. Homer pulled a few pieces out of the woods to provide rain protection for our bees. And the use of them prompted another thought..how about a spot for strawberries? 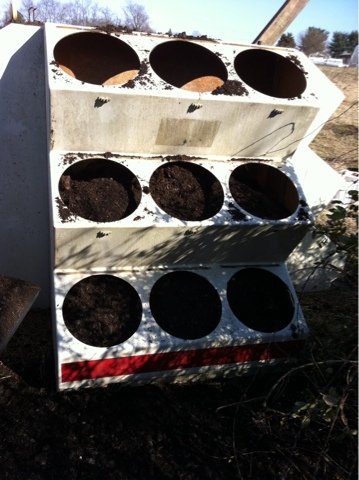 Add compost/manure, water, the plants (a friend is giving those) and room for bloom! 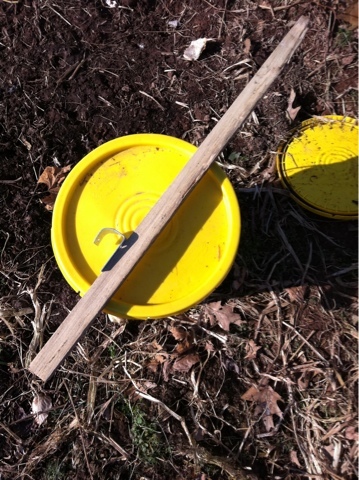 Will help thin plants at their place and bring the thinnings back in the next few weeks. And then we hope for strawberries, fresh, this season! What a great time we had in Detroit! Ideas flew, visions and implementation of plans discussed. Fantastic. And Jessica..what a job she did! 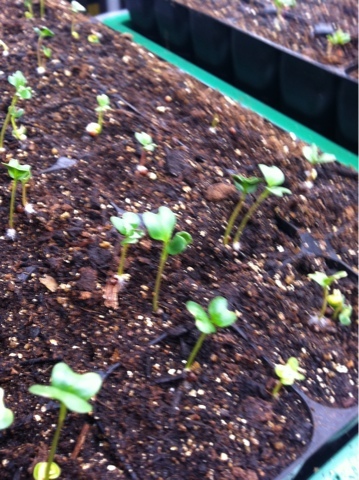 All is well, livestock healthy and happy and seeds planted last week are sprouting. Work on spring prep completed. Also while we were gone the seeds planted in growing medium in pots under lights in the basement sprouted. Now daily monitoring to make certain these babies are moist but not soaked will help us have broccoli, cabbage and cauliflower in 3 months! O! So good to see Sarah, Jon, Otto and cousins Ed & Angie! A couple of days off the farm, time to visit a big farmers market here..Eastern Market, meet some local growers, eat some great food..to contemplate the cost of land, water, super insulated house construction, high tunnels, gardens..such a world of opportunity here! We have met such great people, and to be able to present our ideas, reasons why we farm when we sure did not grow up as farmers..good eats! Sarah has saved her squash grown last summer and shared it with us, baked bread in a bread machine, made us yogurt..oh yeah! And on the farm..high winds, escaping chickens, straw bales collected and stacked..we are lucky to be so well cared for and supported. And our talk at MOCAD..no sleepers, plenty of questions..and after, words and ideas flowed about hoophouses, floating row covers, canning, season extension ideas..such fun to be in the flow of that, local folks meeting each other, including a slim girl, looked to be 10 or 11, who told us in detail about all the things she grows with her grandmother..and information about the group in Detroit that distributes, for virtually no money, seeds, starts, compost, support..word of community kitchens that meet federal standards that are open, opening and available for rent/summer canning sessions so folks can eat what they grow all year round. Lovely! Tours today of other growing things..communities, chicken housing, orchards..inspirational.. The weather has taken an unseasonably warm turn..it has been beautiful out and there is a lot getting done. When running from one thing to another this sight brought me to a standstill. It was a ball of mud moving just outside the back door. The dog used to bark like crazy at every turtle that moved and now just sniffs and moved on. This one is small with bright orange legs and head. It must gave just come up out of the soft ground, the warmer day and night temperatures calling to it. The weather calls to me too. 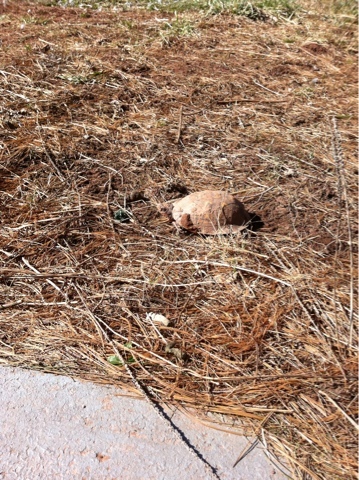 This sighting made me stop, sit, look at the sky, watch the turtle unclamp and head off. Take a few moments to give thanks. 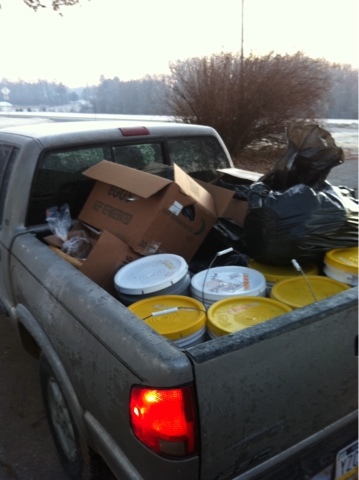 We get buckets of stuff from restaurants for our pigs to eat. Some days we get truckloads for them, some days buckets. The lids are usually snapped on tight. If the bucket tips over everything stays inside as the seal on the lids is tough to break. One problem. I can't get the lids off the buckets. The seals are so tight that I try and try to pry them off and it just does not happen. The big box hardware store sells a piece that works to crack the seal, but still keep the lid usable. 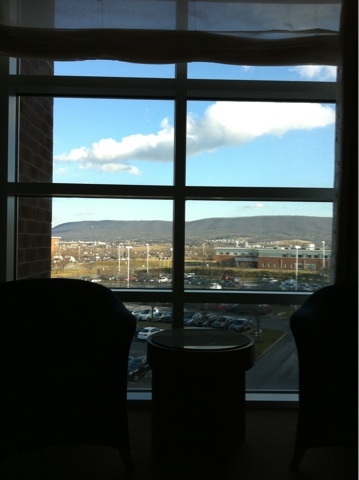 We are equally distant from York and Harrisburg..about 12 or 14 miles, each way, to a big box store. Difficult for me to justify a drive for that one thing, and always forgotten when there for another project. 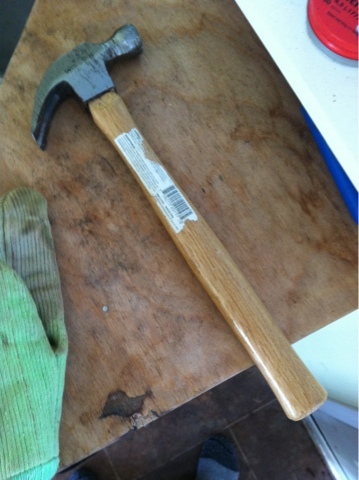 Homer made this tool to pop the seals. It works for him, but I still can't get the lids off! He is left handed and a lot stronger..that must explain it.. When it is my turn to slop the hogs they get apples, not the restaurant mix. Since apples arrive by the truckload there are no lids to pop. And if I can just remember to stop in and get the lid popper..
We grow our vegetables out from seed. 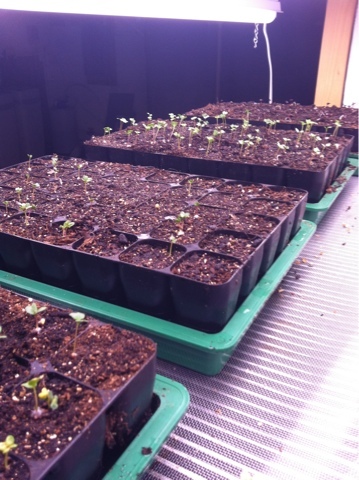 The seeds go in the ground, in a farm made cold frame, in pots under grow lights..it is tough to start to many seedlings and we do our best to over run ourselves. 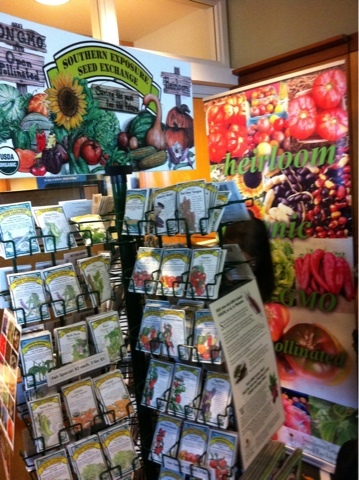 We buy seeds from Southern Exposure Seed Exchange, Baker Creek Heirloom Seeds and Landreth Seeds. The first two are a part of the lawsuit, under way in New York, against Monsanto. The heirloom varieties we grow are threatened in their purity by the GMO pollen drifting off of other farms..I'm not a lawyer and I don't have time to follow along on great detail..but I know Monsanto has put seed savers out if business, has worked hard to force farmers into using their seed, matched to a particular herbicide, that kills everything when sprayed on the field. Monsanto also breeds varieties that have systemic poison in them, killing insects that eat the crop..and every other bug, pollinator, eaters of other bugs and all. From where the business practices of Monsanto are not what I want: conventional farmers say it is the only way to grow enough food for all..but we are managing to scrape by growing and procuring a lot of what we eat outside of their GMO products. We are managing to not gain unwanted weight, to have healthy organs, blood pressure and the like..a video is circulating about the effects of eating conventional and organic does to a persons system, and if it is true it is staggering the difference. 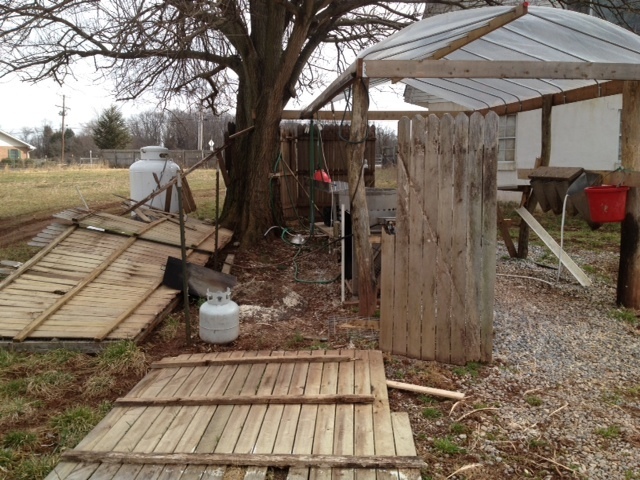 Much to do on the farm, so the lawyers will have to take over in working to protect our rights to grow what we want. And our seed purchases help out in the small we we are able. There are days every year when I am stumped. Astonished. Last year it was Ascension day, when I was on my way to pick up irrigation equipment and found out the hour drive was not needed. The Amish run business was closed for a holiday I did not know existed. Today? 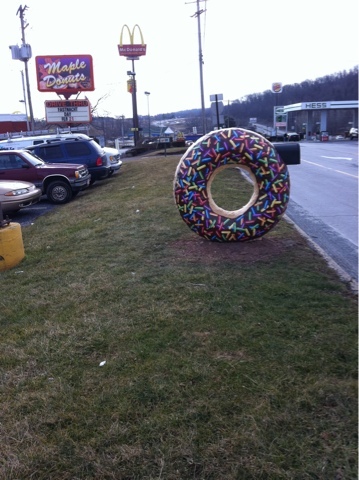 I knew it was Fat Tuesday..getting ready for Lent..but a donut is dedicated to this day, and available only this day? Armies of people preparing this little fat bombs? 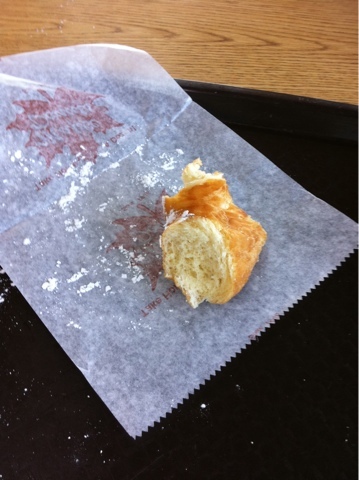 I'm told the donuts are made with potato dough..they sure don't taste like a regular donut..and Maple Donuts, a York based chain with a handful of locations, is packed with people carrying them out by the multiple dozen. Children express astonishment at their parents purchase of so many..donuts. 6 people behind the counter. The PA Dutch..Germans really..don't appear to have big Mardi Gras type celebrations. They are the "plain people" after all. But fry up some dough and it is a celebration non the less! In they go..seeds in the hoophouse and in the basement, under the lights and over the heat pad. Right now it is only plants that love cold: peas, beets, carrots, cabbage, kale, collards, mustard, broccoli and cauliflower. In a few more weeks many more..
We use pigs on our farm to help clear things out..the original bush hogs. Left too long they can be very destructive..they will dig out large holes, leaving uneven ground. Homer has used pigs in place of a plow, a rototiller or backhoe. We have heard that pigs will fix a leaky pond..as they work around the waters edge they move enough dirt to patch up holes, and the pond refills. With the mobile pens, the pigs get moved daily. 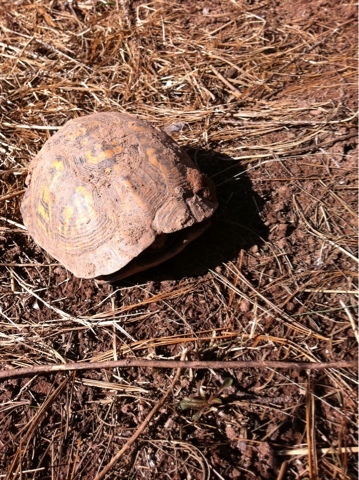 When they get really big they need moving several times a day or they will dig right out. They eat high grass, small trees, pricker bushes, poison ivy, field roses..just about anything. With all of the paddock changes for the cattle there are electric lines that run the length if the property. The pigs are put under those to keep the area clear of growth. Electric fencing shorts out when growth makes contact with it. And as much as the pigs eat and tear up the green stuff returns. Resilient it appears. Most places where you go to eat..restaurants and fast food places..get their meat delivery from a corporate entity. Big trucks, frozen solid meat, chicken. The food usually arrives in prepacked portions, so that it can be microwaved and served. Many times the sauce is already made and included in the package. You can be secure in the knowledge that animal lived in a feed lot and ate GMO feed..the grains that are genetically encoded to survive multiple drenchings of herbicides, fungicides, insecticides..and the restaurants usually takes certain cuts of meat and refuses others. We grow our birds out on GMO free feed. 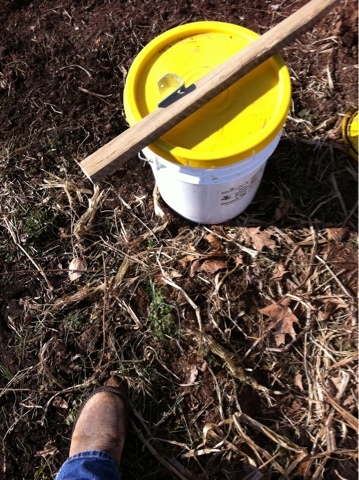 The moveable pens allow us to guide chickens to fresh grass every day. The feed is consumed in about 10 minutes, and the rest of the time is spent for the birds clipping off blades of grass, scratching up the roots, eating anything that moves. And when full size we sell a whole bird, not parts. We don't offer chicken sausage, or jerky, or nuggets..just whole, ready for the oven birds. This would typically eliminate any restaurant from doing business with us. Our way of growing is..odd..by industry standards, because we don't grow birds in the winter, when grass is not growing. If you are mowing your lawn we are growing birds..if not we are not. 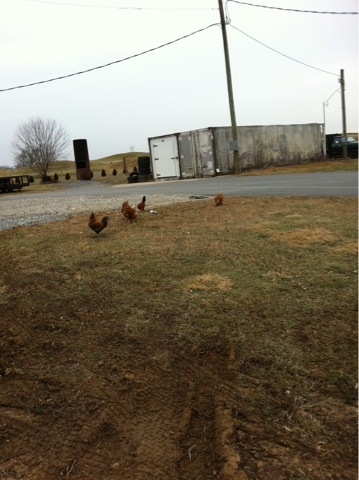 The exception is our flock of laying hens..they stop laying in winter, but are still in outdoor pens and moved daily. A few eateries have asked to have our birds this season. Places that cook up the entire bird, know what to do with chicken feet, and with the prettiest livers ever. And the food is ridiculously delicious. Places that do the same with an entire steer or pig, cook up every piece of it. 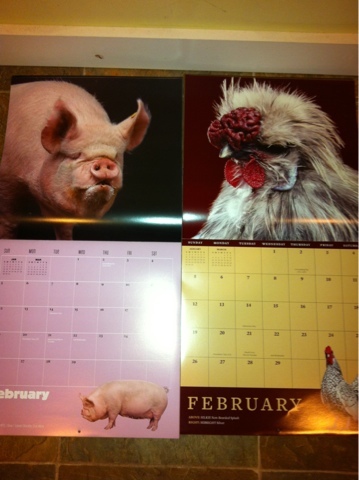 I'm told we have made it onto the meat calendar. I have to admit, there was a sizable portion of my life when it never occurred to me that a meat calendar existed, for anyone. Now we are proud to be on it. It is time to build more pens. No question about it. We have a schedule to meet. We started farming because we love to eat, and neither of us were happy with what we were eating. I had worked for Random House, publisher of Andrew Weil and Deepak Chopra, who each, to my ears, had the same message. Eat food that is real, not processed. The closest to a natural state is best. Put flowers on your table. Eat your veggies. I'm over simplifying. But the basic message has not changed and we listened. We eliminated partially hydrogenated vegetable oil 15 years ago. High fructose corn syrup not long after that. Then began a search for chicken with flavor. Not flavor enhanced..not salt with a long list of chemicals added to it, but clean clear flavor. Like the chickens Homer's mother raised. We couldn't find it. So we grew it. And then added eggs. Yum. The best eggs. Chicken and eggs that made a corporate career look..less attractive..
And the beef! The pork! The turkey! And those vegetables..
We thought entrance to the big, high traffic farmers markets we attended would be easy. Put up a table, an umbrella..and provide people searching for the best chicken and eggs exactly that..the best chicken and eggs! It has not, it turns out, been easy at all to get into the markets where we could be there 1 day a week, selling what we grow the rest of the week in one customer filled day. And now, gas has jumped. 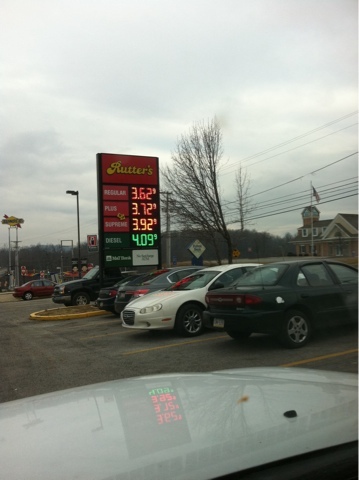 The price is predicted to jump another $.25 per gallon over the next 11 weeks. That would be ok if we only needed a couple of gallons each week. But even our little, 4 cylinder, push the button not the remote locks, no cruise control truck uses a fair amount of gas. So. We are limiting the number of farmers markets we attend. 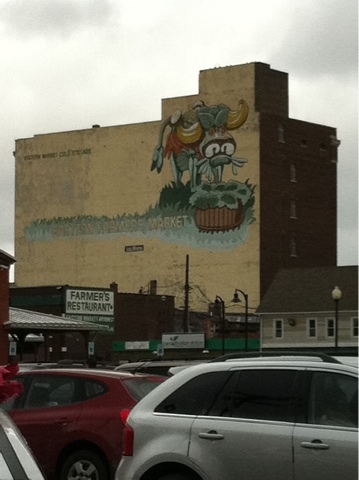 I have always loved a farmers market..from college and The Lexington Market, to Waverly and under the fallsway, to York Central, Hershey..and all the markets I checked out in every city I traveled to in my previous, on the road life. But markets are a numbers game. There has to be enough foot traffic to offset that per gallon of gas, there needs to be a reason for me to be in one spot for 4-6 hours, not working on the farm. My leap of faith? Only 2 markets this year. Farm pickups, CSA deliveries and restaurant sales. That is it. Egads we hope it generates enough for us to stay..farmers..scared to death..
Tucked into a sloping hillside just outside a small town is our butcher. A USDA inspected facility that converts our livestock to delicious, manageable portions and cuts. It is not a huge facility. There are 2 people in customer service, right there as you step in the door. Butchers are in the back, only their cars are in evidence. They smoke meat there, so sometimes you can smell mouth watering goodness from the stack. It is quiet, and truly a local employer, a small business, an entrepreneurial enterprise. From the main road you would drive past and never know it is there. I can't wait to have our freezers full of what these good people do for our farm. It is truly like money in the bank. We are happy to see thus facility full of people and business and so close to our farm. 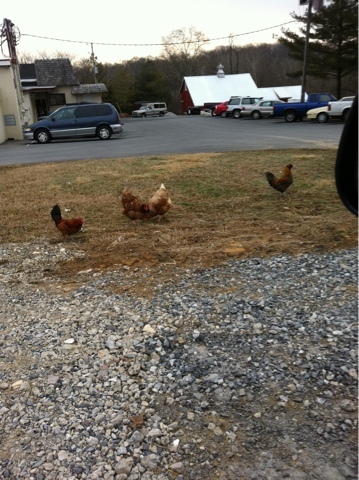 And full of chickens too. And reusing stuff..that box is a freezer container..a creative reuse of an item that warms my heart. We know where our food comes from, and are truly happy about it! I love my family and friends, and am grateful that most are happy and healthy today. There have been losses of loved ones this year, and my heart goes out to each that has lost. I'm grateful for so much. We get to live a life I love, on a beautiful spot. I have the gift of strength and good health. The love and support of many. 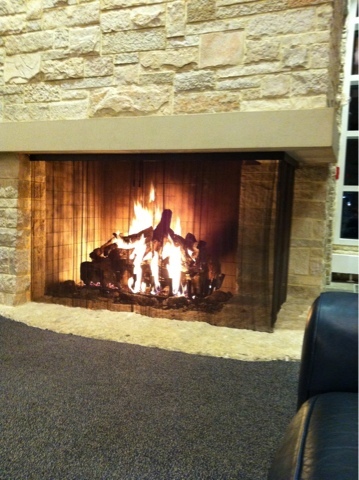 Warmth on these cold days. The ability to grow, prepare, share and eat the best food in the world. Freedom to think, write, discuss, believe, research, contemplate as I want to. 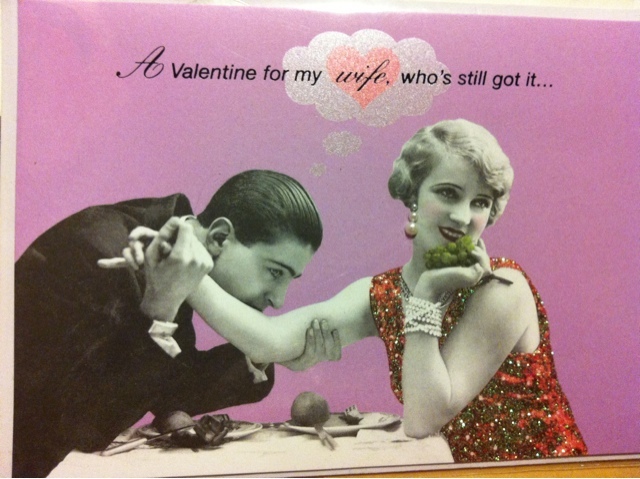 What a lucky woman I am! Right now it is time to feed the livestock, haul water, move pens and hopefully gather some eggs. Later on today a truck bed full of slightly rotten apples is on my agenda..happy pigs after that! And this, from my sweet husband..
York County is working on a conference, scheduled for November of this year. Addressing local food sustainability..getting food grown here eaten here. I have known a few addicts in my life. Alcohol, street drugs, prescription drugs, food..drama. It is so difficult to know when to step in, when to walk away, when someone else "bad" for them should be removed. I've known people who go to serial rehab and don't get it. Others who get it by only attending support meetings. Others who never attend meetings or rehab. And many, many more who believe they can manage, can handle, are functioning, are not ruining..and continue to use, continue to accelerate the destruction of their systems. For a variety of reasons..people believe they can abuse strong substances and be the same on the other side. They can hide it and no one notices. But it is noticed. The compound effects are seen, felt, witnessed by all. The knowledge that for the addict nothing else is as important as lining up the next using session, no matter how close or far apart. No matter what it does to loved ones. Ach. What a shame. I would have been happy to listen to Michael and Whitney as they aged. I've heard Smokey, who still sings like magic. Tony, at the age most folks are buried or in retirement homes, still singing with Gaga. I even listen to Bob even if I can't follow along. Just a damn shame how addiction takes people. And how even when others see it coming can't stop it. Our soil leans toward clay. At the other other end of the spectrum is sand, and somewhere in the middle is loam: soil that will hold water but not for day and is filled with good stuff plants need. We are building that soil. 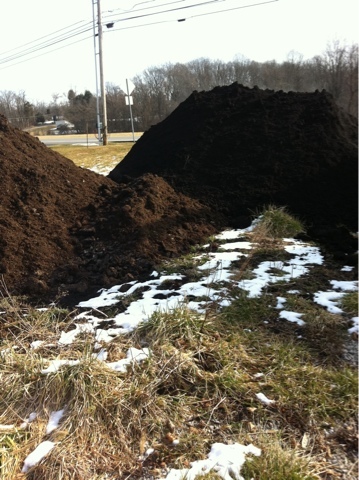 Just delivered are 40 yards of leaf gro and 60 yards of manure. A tractor trailer of each. 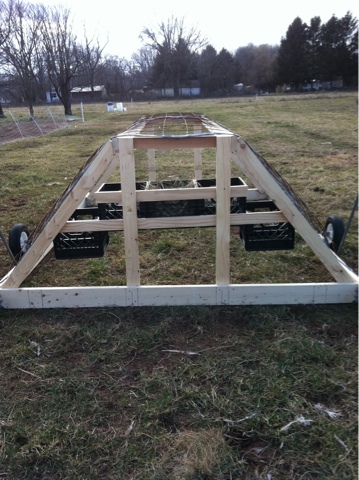 We will add to our vegetable beds to make even deeper soil that can grow a great set of roots. 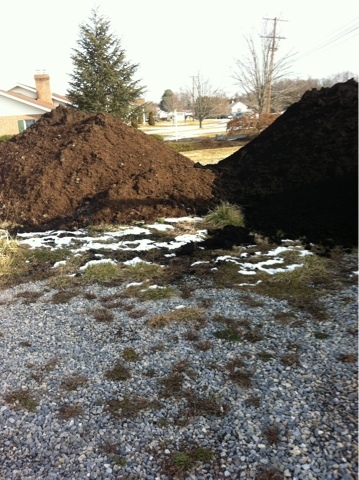 We shovel this into the back of the truck and then fill in the planting beds. 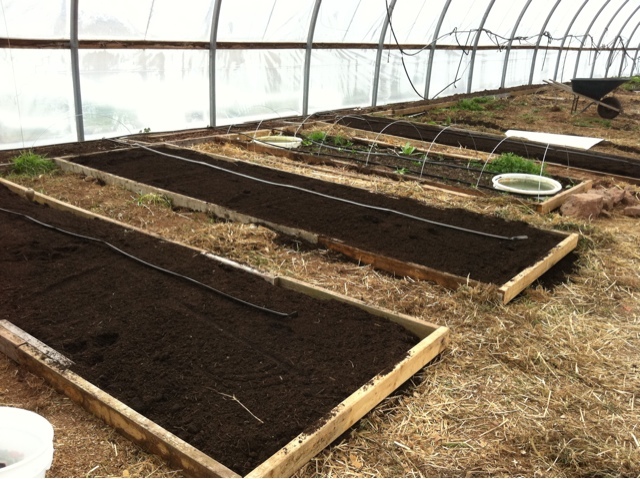 Vegetables are heavy feeders and love organic matter, so additions are needed each year. How do you spend March and April? It was 23 degrees here at 6:30, 22 degrees at 7:30. 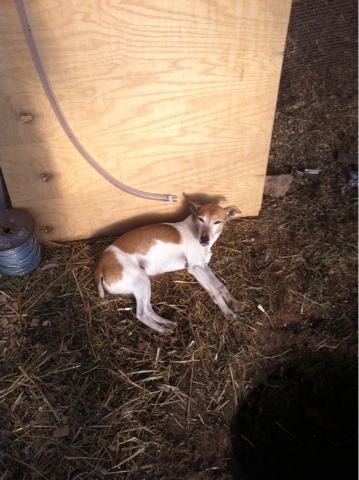 Every animal is quiet, snugged into straw, working on warmth. With these very cold temperatures every water container is frozen, some frozen solid. Those that can be are broken with hammer, so that animals can hydrate. 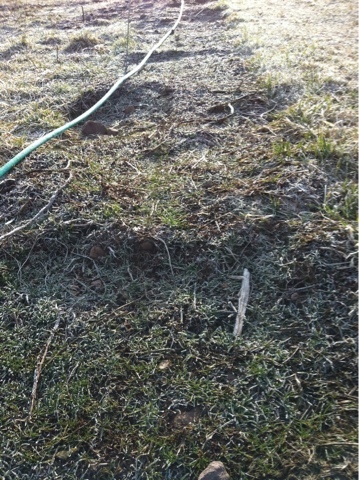 Even in the sunny, still, cold morning they all need water. I'm a little envious of the cattle. That layer of leather on them means the cold barely has an impact on them. They look comfortable and happy. Yesterday it snowed a little. A light coating on the grass. Today the sun will shine and melt it all away, and Homer and I will continue to map out our year, to calculate and plan, to mentally hurry up our compost so we can add it to the soilless mix for our seedlings, to examine pens and salvage what we can, to prepare paperwork for accountant meeting for annual taxes, to get on getting planting beds built..there is more, during this, our "quiet" season. And to remember to stop, relax and enjoy. To mimic the dog, who locates a sunny patch anywhere she goes, lies in it and rests before she gets back to the work she does here. Rest. Physical, mental and spiritual. Daily. Good thing to do, even on days when it feels like an indulgence. There are hoophouses going up all over the country. 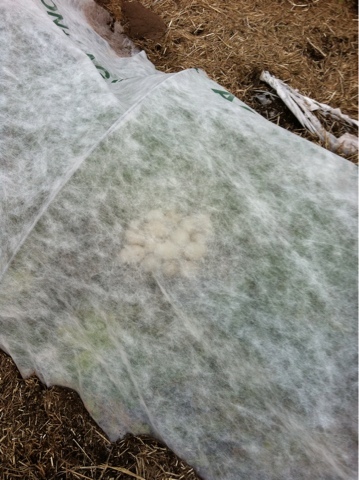 These unheated plastic covered structures are a way to extend the growing season in areas where it is too cold to do so without one. I keep seeing photos of hoophouses that are empty. Nothing growing in them during winter, and it breaks my heart. The cheapest thing about growing is seeds, so we are planting all the time, sometimes with floating row covers, sometimes open. We started what we thought was massive amounts of kale and collards last fall. Never imagined that we would eat and sell that many greens. Turns out we have none left, it is only February, and greens fresh from the hoophouse were really delicious..after cooking garlic and onions in olive oil in a cast iron skillet, washing the fresh cooked greens, dropping them in the pan with that much water, flipping them over just until they wilted..we and others could not get enough of them! The cold makes them sweet, there are no bugs or slugs..fantastic. We will fill the hoophouse next fall. Now that the greens are done the peas are in. We put peas in last fall, and it turns out they really need to go in, around here, a little earlier. There were not many actual peas, but we were able to eat the greens and feed the pigs with pea greens as well. Now there is a new planting of peas in the hoophouse. Several rows of trellis, double rows of peas. And now, February, they are growing. 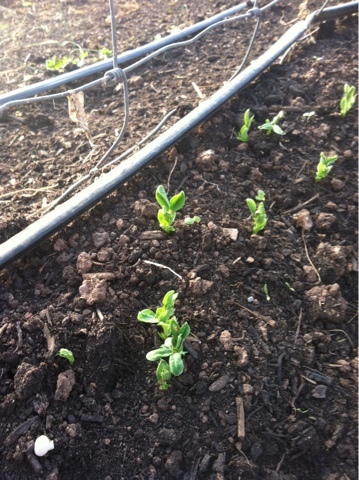 We are working on getting a jump on the season, on having peas for the CSA right from the start in mid-May. When peas are done as it heats up tomatoes go in. Peas fix nitrogen in the soil, tomatoes need tons of it. Happy tomatoes. And a truck load of funky stuff, making for happy pigs. If it goes squishy they like it even better. These days it is beautiful. Clear and sunny with temperatures above freezing. It feels like spring. It feels like the worst of winter is over, like it is time to get a jump on the season and plant! Walking around in this mild weather fools me into thinking we are out of it, winter is over! 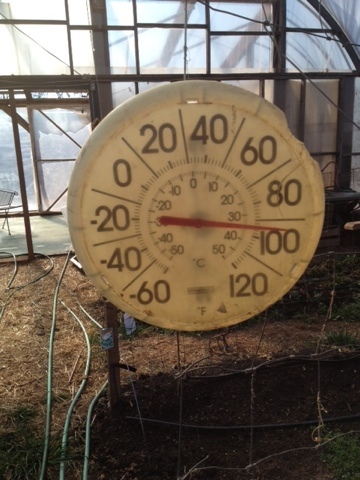 In the hoophouse it is over 100 degrees! But the weather forecast calls for snow..tomorrow. A wintery mix. Not so fast on those predictions of winter being over. 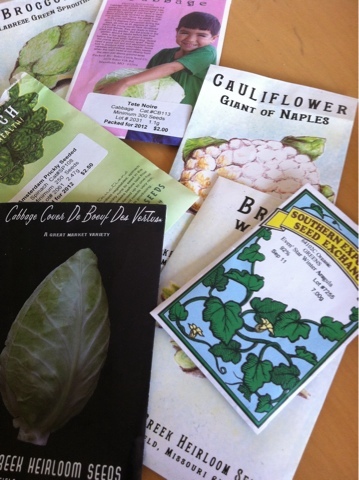 Just time to start some seeds inside, give them a chance for a jump on the season, and maybe to plant a few, experimental seeds under the hoophouse. Homer put pea seeds in a few weeks ago. They are sprouting and look like their own little eggs hatching. Peas are exceptional that it is so easy to see them growing, so amazing to eat them fresh. Peas love cold weather and hate the heat, so we will start more to have plenty for us and our CSA customers. Our thoughts as we plant? "one for Claire, one for CSA, one for Homer, one for CSA, one for Dru, one for CSA"..that is how much we love fresh peas..
We are back on the farm. 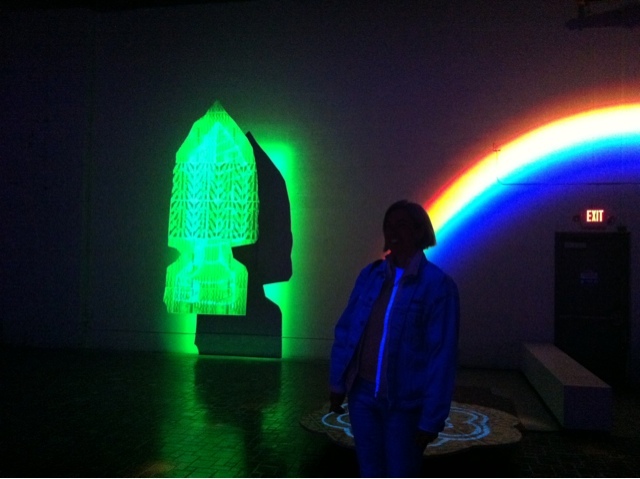 I experienced a fun hangover..headache, stomachache, backache. Feeling better this morning but kinda lost yesterday. Homer reassembled the pen he took to the PASA conference. 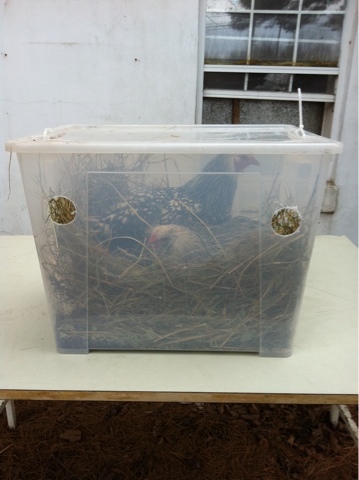 The box with the lid that goes the width of the pen has been problematic, as hens will escape from one end while we gather eggs from the other end. If we had only Barred Rocks and Rhode Island Reds that would be fine, but we have about 100 hens that lay white eggs: the Minorcas, Anconas and Brown Leghorns that are smaller, flightier birds. Once they escape they are impossible to catch, as they move faster than we do! And we love when our egg cartons have blue, white and many shades of brown in each carton. This pen design does a much better job keeping the hens inside and their eggs too. 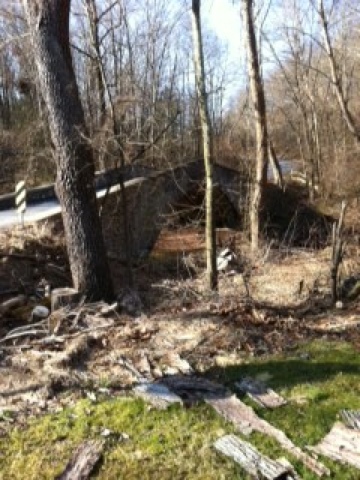 Right around the corner from us is this beautiful stone bridge. Built in 1910 it is made from stone, spans the Conewago, and is an engineering project that Homer just loves. It is not on our way to anything we go to, but he takes a bit longer way home somedays just to see it. Small and magnificent. And that bridge might just have influenced his latest pen design. The day began with a presentation on the topic of having livestock and vegetables and low tech, fossil fuel free solutions to manage. It went pretty smoothly, with only a couple people falling asleep in the first (and early) session. Then a keynote speaker, Shannon Hayes, who has written a couple of grass fed meat cookbooks as well as the book Radical Homemaker. Her premise is simple: if you buy less you need to make less and if you buy local much can be bartered. That the work of a family has become shopping..for things that people used to make themselves. Of course many Amish and Mennonites attend the conference, and they never moved away from the idea that family is first, children need age appropriate responsibilities, that growing, preserving and managing your own food and land is the work intended for us to do. Shannon also writes about an intentional decision to live this way..to be near different generations of her own family, to labor daily on the farm, to decide what to take to the farmers market, when to relax and enjoy the day..and does so, daily, with her husband. And with her children, parents, aunts, uncles, neighbors, friends. She ties in history, pop culture and plenty of humor. We will read her book aloud to each other as we do most others: as we drive places and return back. Then we had the opportunity to take the kids who were in camp programs to see the chickens and to move the pen. Homer always says his pen design is so little ones can move it as well as old folks..and while some of the 6 year olds could not budge it there was a strong 4 year old who got it rolling! I tease Homer sometimes about over engineering but when that little girl got that pen moving it was beautiful to see. The hens moved right around and were just as happy moving as being in one place. And then a session on flower growing, what a delight. 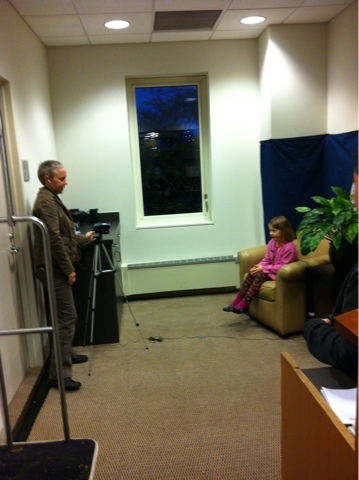 Little nuggets learned that will be implemented! Home again and time to get back to work. With much gratitude to Jessica, who made our trip away from the farm possible..the place looks fantastic after being in her care! Thanks for being here and allowing us the time away. We ended the night watching a movie about agriculture in Detroit. We will travel there in a few weeks to talk about agriculture, housing and food. So glad to see there is much going on in Motor City already! 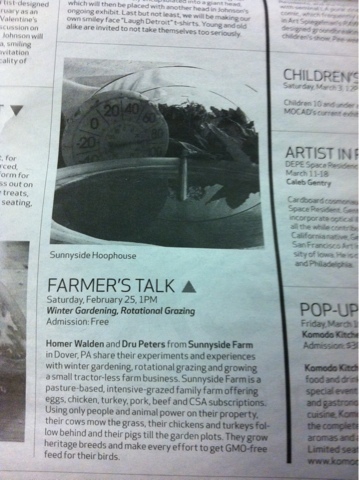 Homer gave a talk yesterday on rain barrels, irrigation, drip tape and using the hoophouse. 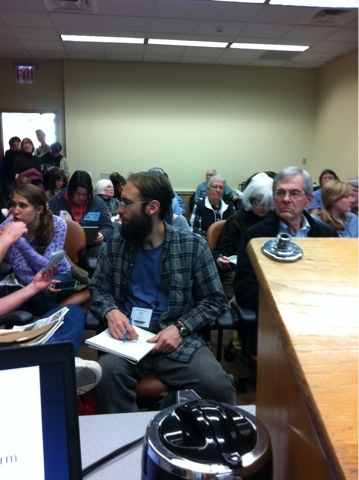 The room was close to full before he started, and overflowing at go time. No one fell asleep, no tomatoes or rotten eggs thrown. This morning is the talk we give together, on integrating vegetables and livestock on the farm. 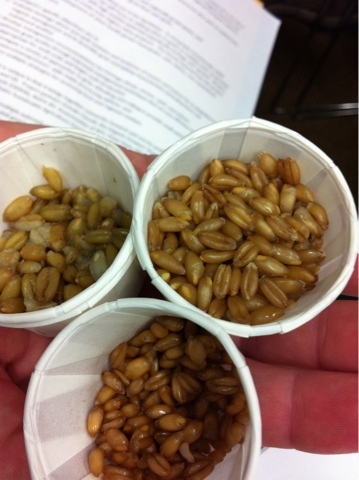 We tasted ancient grains. There have been sessions on locating, growing, harvesting and grinding of the types of grains that used to be widely grown and consumed in smaller communities. There are small grinders that can dehull or deburr or make things like corn into cornmeal. There was research sighted that indicates that the GMO wheat might just be the source of gluten intolerance running rampant now. I attended a session with the author of the book Radical Homemakers..her focus on an active, thoughtful decision to opt into a lifestyle change really resonated with the large crowd. Her book was already in the kindle and will get read sooner rather than later. Keynote speaker..the guy who publishes Edible East End, about food on Long Island. His work with that publication, the Gates Foundation, and the growing of oysters "in his back yard" (his house is on the water) was great to hear. Meals with friends, lots of laughter, hugs, meeting with new people, music, seeds, tools..it is a luxury for us to be here. Claire joined us last night and will spend the day here..she opted to go to class Friday and drive up after they were finished..so an extra bonus to get to see her! Homer will offer a class in April..pen building..and has a demonstration pen here. One spot in the class is being offered as part of the silent auction, and already had a bid that exceeds the usual cost of the course. Giving a little back to PASA. And one of our favorite seed companies is here, a little shopping will happen today! We had a great day at the conference. 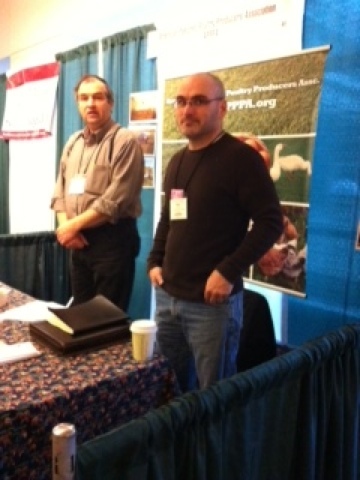 I was able to spend the day in sessions with the holistic orchard guy, Michael Phillips, who grows in New Hampshire. First time I heard him and read his book I could barely understand what he was saying, it is so different from traditional orchard care. I'm starting to understand his management practices. Homer built a pen and brought a couple of hens with us to demonstrate just how his pen works. We loaded them into a tub with holes in it..the dog crate was way too big with everything else loaded on the truck..and when I was interviewed by Hannah I got to hold one of the hens! Maddy is the little interview..
And a couple of different views for us..a roaring fire in a fireplace and a 3rd floor view of the parking lot, not what we usually see..
Eli Reiff, who builds the chicken processing equipment that we use on the farm is here with the American Pastured Poultry Association, tells us he is working on getting a ride to the pen building working scheduled for April. Homer asked to make certain it was ok to take a photo..that was ok, but Eli still does not operate a motor vehicle, and we live too far apart for him to reach us in a horse and buggy. 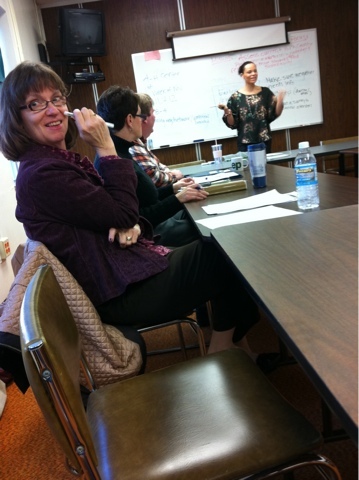 Today Homer speaks at a workshop, this morning we both are listening and learning in other sessions. 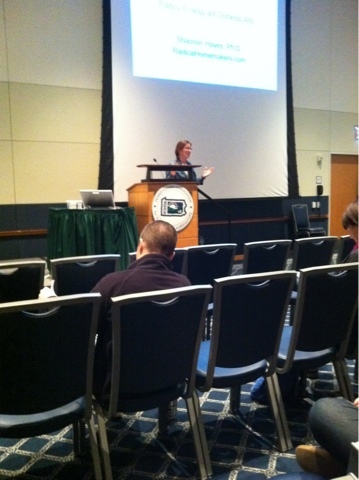 The first day of the PASA conference was awesome. Homer built his pen, found a patch of grass at the conference center for it, and installed a couple of laying hens in there. We attended a Food Alliance dinner and panel..had the opportunity to talk about our decision to be Food Alliance certified on our farm..we love that it addresses many issues of farming, not just feed. The food was great, our turkey that the chefs here roasted was delicious, and the chance to catch up with our fellow Food Alliance farms is most appreciated. The dog is mad at us. When she saw Homer loading the truck she jumped in. 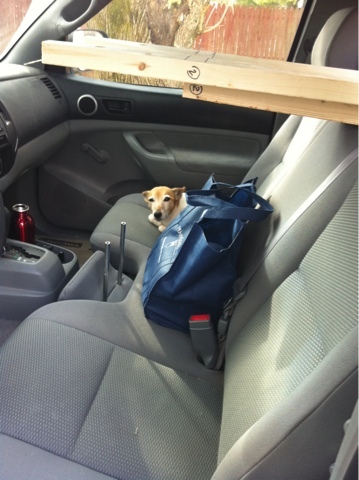 Loading all the parts of the pen required him to leave the doors open and since it is 60+ degrees Sandi was outside, on alert and hunkered down in the seat of the truck. When he asked her to get out she refused to budge and then snapped at him. Once again proving we are not the alpha with that dog! And Jess reports all is well at the farm. And that the dog managed to sleep on the bed..never happens when we are home..that dog will really be mad when it us back to the basket..
We work hard at keeping all of our laying hens in pens. 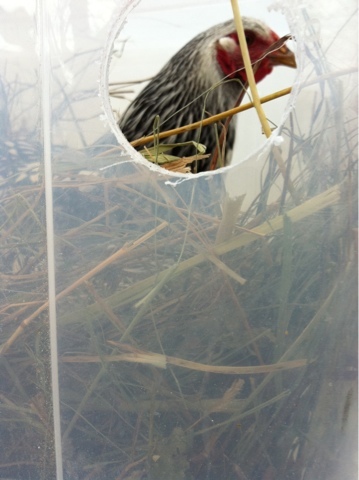 Sometimes, while collecting eggs or moving their pen a few escape. Most are pretty easily caught..but the Brown Leg Horn, the Sicilian Buttercup, the Ancona and the Minorca..and even a few Buff Orpingtons can be really difficult to catch. I'll see Homer running with the landing net..yup, the fishing net, chasing hens down. He will also lure them back into their enclosure with tasty tidbits we get from restaurants..stems of lettuce, apple cores, potato peels..it is an almost daily coaxing of getting the girls back where they belong. And we don't have very many eggs at this time of year. 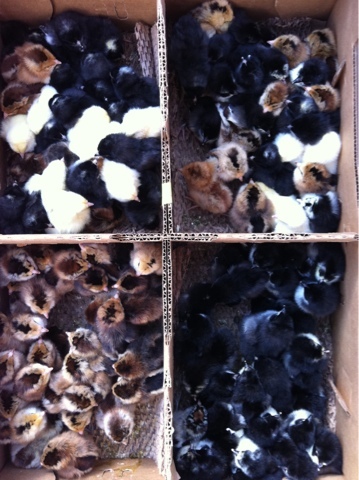 They love spring and summer for egg laying, wintertime not so much. 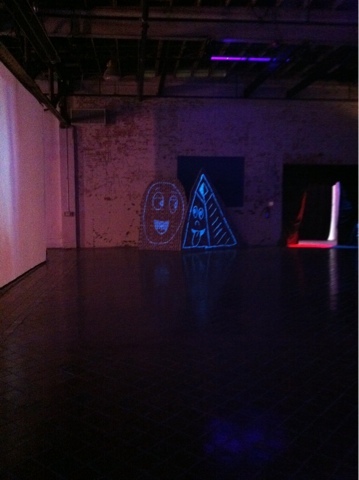 And then we find something like this. Two little hens have been inside the garden area, we have not really tried to catch them, figuring they are on bug duty on these oddly warm days. 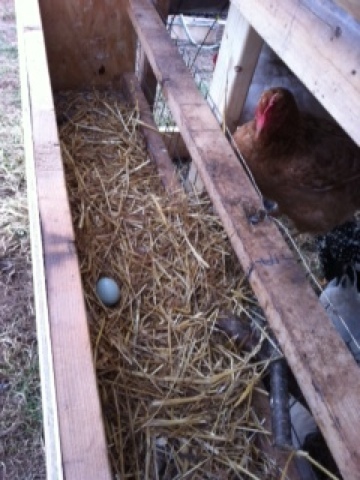 Here under the floating row cover the two of them have established a nest! No idea the age of those eggs..sadly for us the eggs become pig food. Pigs are happy, they will eat them shell and all. The two hens will return to a pen, where we hope they school the rest of the flock in wintery egg laying.